Pet Friendly Hardwood Flooring – Texturewood® Floors by Birch Creek Millwork, Inc.
What is Pet Friendly Hardwood Flooring? Traditional smooth hardwood flooring can be naturally uncomfortable for pets because of the low traction it provides to pads of their feet. Combine a smooth hard surface with a high glossy finish, and you have created an unnatural terrain for animals. They may use their nails to find little success in gaining traction, and leave scratches behind in the floor. We have found there are a several ways to eliminate these problems for pets and owners. The number one trick is to add texture to the floor. We have found that the 3D texture works very well in providing traction for pets both horizontally, and vertically across the board. Other textures such as Circle Sawn, Hand Scraped Plus, Wire Brushed, and Band Sawn are also very good for providing traction for them. Another benefit of adding any texture to your hardwood floor is that as life occurs, blemishes will simply add to the dramatic effect achieved by having a textured floor. Small dents, scratches left by nails, and other signs of wear and tear will be disguised and blend into the character of the floor. 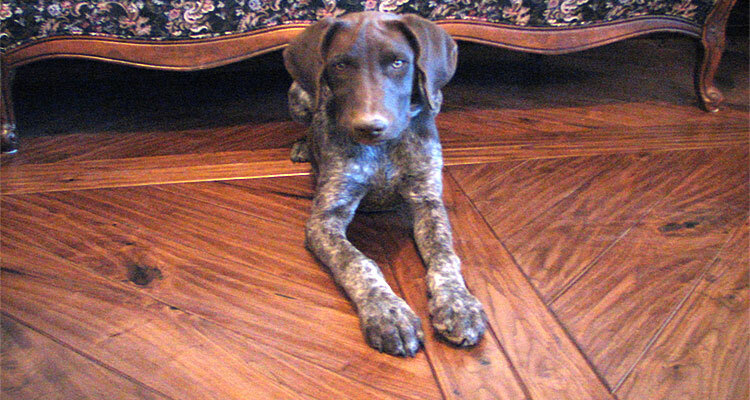 More and more pet owners are finding that having textured floors results in less maintenance and longer lasting floors. Hardness: A hard floor will resist more denting and wear than a soft floor, and this is measured by the Janka hardness test. This test measures how many pounds of force are required to drive a .44 inch steel ball halfway into the wood. Janka ratings can be found on each of our species pages underneath the pictures. Wood Grain: Some wood grains are more dominant than others, and can be used to disguise minor dents and scratches. A dominant grain pattern can help blend blemishes into the floor and appear like part of the natural wood texture. Ash and Oak are good examples of this dominant grain pattern. Color: Neutral brown colors help to hide some of the dirt and footprints found in floors. Pet hair and minor scratches are barely noticeable on a natural brown floor, but may be very distinctive on a very dark or light colored floor. Finish: High glossy finishes are not highly recommended for pet owners. We would recommend a finish with less sheen that does not reflect much light. A matte or low gloss finish will be best for keeping your floor looking new and clean.